path vs. the Lions tomorrow afternoon? Today on Vikings Corner we will give you all the information before the Vikings take the field vs. the Detroit Lions tomorrow. The Vikings are looking to get back on track and are in a "must-win" situation tomorrow afternoon. Losing two games in a row will hurt any team, but when your remaining seven games are against teams like Chicago, Green Bay, and Houston, you must win as many other games as possible. The Vikings offense has been anemic over the past few weeks and must be improved in order to win tomorrow. Christian Ponder needs to break the 100 yard mark in the passing category and Adrian Peterson must continue his consistent play. This won't be an easy task for Ponder, as Percy Harvin (ankle) has been ruled out for tomorrow's contest. Harvin has been one of the key staples on this offense and has been electrifying this season. He single handily defeated the Lions in the first matchup of the season at Ford Field. Ponder's play just needs to improve remarkably and as we have discussed in posts this week, he has a long way to go. 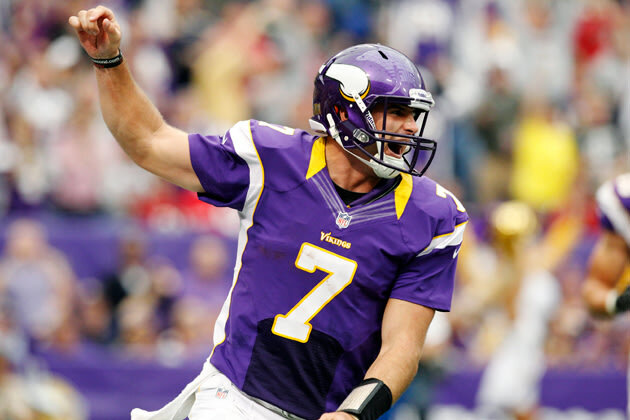 Decision making, play calling, and game presence must be displayed for Ponder to be succesful. This means other players like Jerome Simpson and Jarius Wright will need to step up. Simpson has seen extensive action, but hasn't been the most effective as of late. We need to establish the run and short intermediate passing routes and then look for Simpson vertically. Jarius Wright will most likely see his first action as a Minnesota Viking tomorrow. I can't wait to see this and expect him to be an impact early and often tomorrow. He had 12 touchdowns last season at Arkansas and will finally get a shot to prove he is worthy of being active each and every week. Where has Devin Aromashodu been over the past four weeks? When we were successful Aromashodu made some huge catches and was a great possession receiver. I don't understand why the have continually shied away from Devin as the weeks have progressed. He will need to be used tomorrow and I hope he has a huge day to prove he is worthy of playing time. Moving towards the defense side of the ball, I have several key goals that must be accomplished for a victory tomorrow afternoon. The defense must force turnovers and give Christian Ponder and the offense a short field to work with. We continually forced turnovers and stopped the run game in the first few weeks of the season and now we struggle to be positive in that category. I can put my finger on why this is a fact and it is because the defense has been relied on more and more over the past few weeks. Time of possession has been more than double to the opponent and the defense has been drained by the forth quarter. This is one main reason the Vikings must control the clock and maintain drives on a consistent basis. Our defense played at a high level over the first few weeks of the season and we are closer than most think. If we can control time of possession and stop the run, we can give ourselves a chance to be in the game in the fourth quarter. I'm interested to see Bill Musgrave's supposed "new look" scheme they applied in practice this week. Maybe we can hit the tight end once or twice and complete passes within 10-15 yards of the line of scrimmage. I feel like we have ran away from what was working over the first few weeks of the season and it is frustrating. I have confidence that we will find a way to get this issue resolved and we will eventually get back on track. It may not be tomorrow, but it will happen in the coming weeks. It might be too late to salvage the season at that point, but based on the coaching staff's willingness to develop for the future it will be a long-term "win." Overall, tomorrow will be interesting day as I can't wait to see how our favorite football team responds to adversity. Now comes the dreaded Vikings Corner score prediction for tomorrow's game. Our offense will continually be a work in progress and Mikel Leshoure will have a big day against the Vikings rush defense. I hope this prediction is wrong, but based on the play over the past few weeks you must put the Vikings on the losing end of this contest. Skol Vikings! Let's get to 6-4 and get back on track before the bye week!